Three birds hatching one nest =) "PICS added"
Discussion in 'Incubating & Hatching Eggs' started by Chef, Aug 5, 2009. 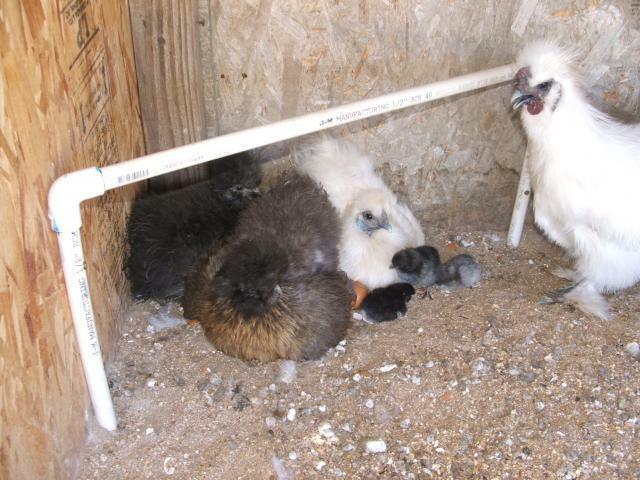 So I have two silkies and one showgirl sitting on a nest with 12 BC marans eggs and I went out today to find what looks like three babies that are hatched out already I set them on 7/19 so it looks like we have a few early visitors. It has been over 100 here a few times over the past month so I wasnt sure if they would cook or not but it looks like so far so good! I also wasnt sure how three girls would react to the babies and it looks like they are all doing a great job! I'll get some pics later when it cools down! Quote:I know right three mommies! I'm sure the mommies are gonna be happy too dividing up the work we'll see. Has anyone else had mutiple hens hatching one nest? i seem to have the same senario with my doves, i have 3 sitting on 4 eggs they sure do like to help incubate. Good Luck with your eggies!! I have had co- parenting banty cochins twice this year. They share the nest then when the babies hatch "Jet" takes over protection duties and "Sylver" shows them how to eat etc. Both times around day 3 there was some fighting. The first time it was terrible and we temporaily seperated them for a day. This last time they fought a little on day 3-4 again, but worked it out fairly quick. Jet is the first to stop caring for the babies - it seems that once they integrate into the flock she feels her job is done. Sylver is slowly letting go now. They are both laying again and the babies actually sleep cuddled up to my BCM roo at night. The chicks are around 5 weeks old. Well thats a cool story. Ya I just dont want them beating up the babies fighting over them. So far everything looks good. Here are a couple pics of the three that are out already with the mommas and the young cockerel that thinks he's a dad already. Although he hasnt even mated any of the females yet He is already showing the kids around for food. Its so funny! Both of my roos are AWESOME with babies. It's too bad the BCM hates me. That is a sweet picture! I would just keep an eye on the mamas - in my case the babies were not in any danger but the moms definately were fighting like a couple of roos. ETA: What is the PVC pipe for? I will defenetely keep an eye on them! All my silkies roost and my roost are higher than that.